Maria Irene Fornes is the most influential female American dramatist of the 20th century. That is the argument of this important new study, the first to assess Fornes's complete body of work. Scott T. Cummings considers comic sketches, opera libretti and unpublished pieces, as well as her best-known plays, in order to trace the evolution of her dramaturgy from the whimsical Off-Off Broadway plays of the 1960s to the sober, meditative work of the 1990s. The book also reflects on her practice as an inspirational teacher of playwriting and the primary director of her own plays. 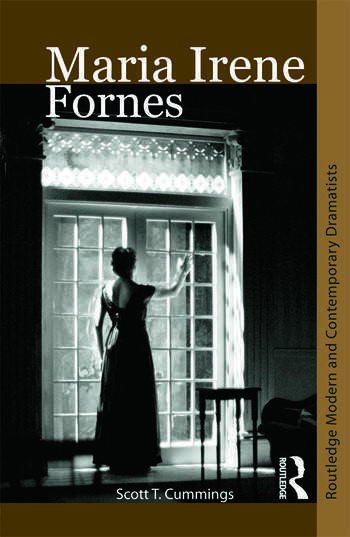 Drawing on the latest scholarship and his own personal research and interviews with Fornes over two decades, Cummings examines Fornes's unique significance and outlines strategies for understanding her fragmentary, enigmatic, highly demanding theater. "Let me be wrong. But also not know it." "If we're showing what life is, can be, we must do theatre." "I have to learn how to lead my life." "The Poetry of Space in a Box"
"Where are we in relation to all this?" "This must be made by a person." Scott T. Cummings is Chair of the Theatre Department of Boston College, where he directs plays and teaches courses in playwriting and dramatic literature. He is the author of Remaking American Theater: Charles Mee, Anne Bogart and the SITI Company, as well as numerous performance reviews, journal articles, and essays on contemporary American theater and drama.